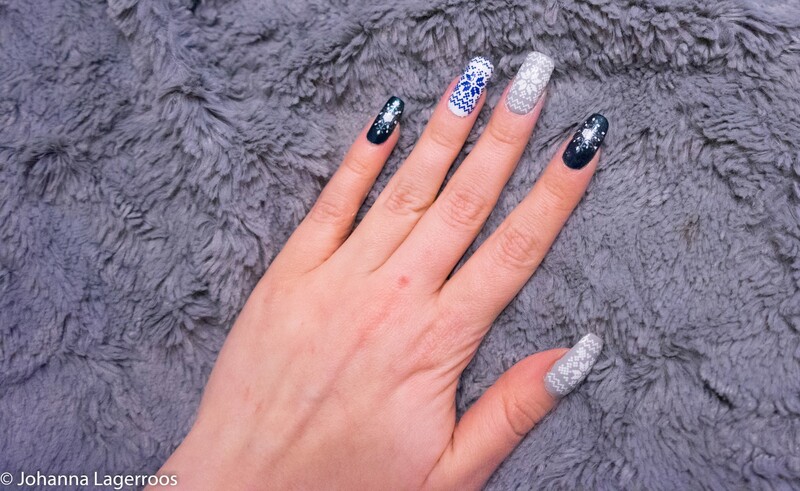 The first nails of this holiday season are here! I have been brewing ideas for nails the whole November, and try to bring few to you here in the blog and in case I have extra time in my hands, I'll post some additional ones to my nail Instagram @silvertigonails. But without further ado, let's get into the nail art. So for the first winter nail look, I wanted to do something that isn't necessarily too Holiday themed, so that I'd have more to offer to you than traditional red, gold and red designs. I saw something like this done by @lieve91 (click here for her Instagram), but wanted to do something that isn't a blatant rip-off of her design. But, I was influenced enough that I feel crediting her is due. The color scheme, snowflakes and matte finish were absolutely inspired by her. I assume the inspiration mani was actually all handpainted, but as I've promised you more easy Access manis, mine were done by stamping to keep things easy. 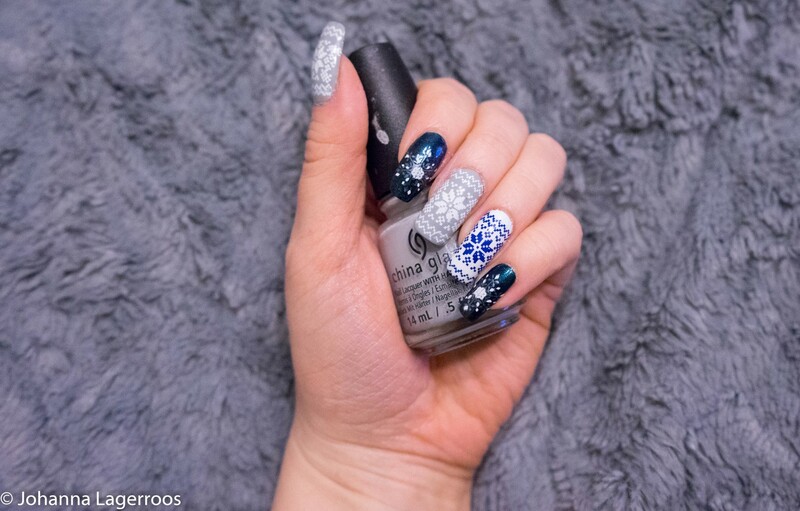 I used Better Not Pout stamping plate by Clear Jelly Stamper, together with the actual clear jelly stamper, white stamping polish by Born Pretty Store, sheer Silver stamping polish by Konad, and One Track Mind by China Glaze. The matte finish was something I was really loving for this mani, but for my shiny finish lovers out there, I chose two pics with the shiny finish before I added the matte top coat over everything. 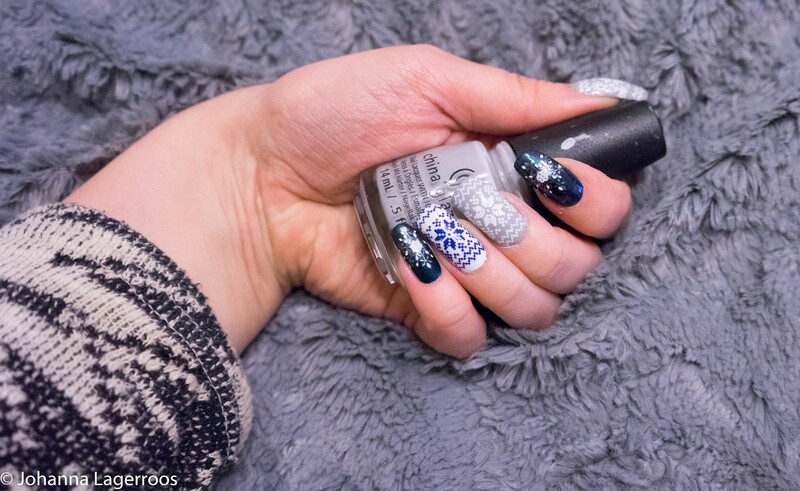 Those you can spot below, and please do let me know which finish you prefer for this mani! 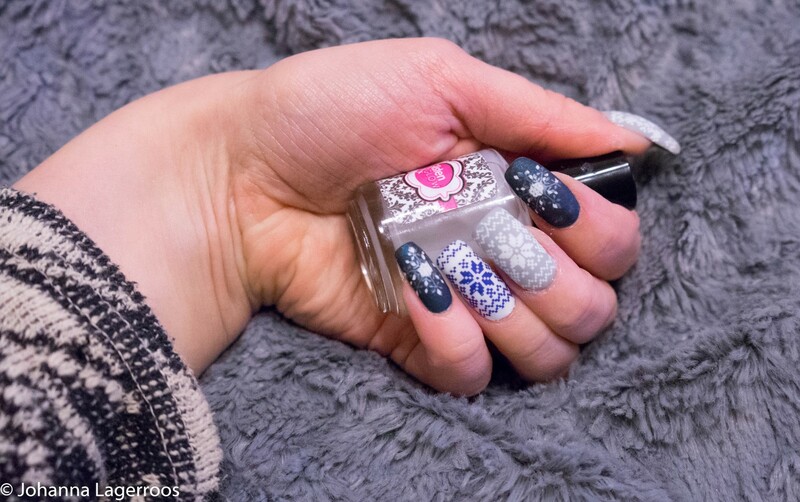 I already told you the stamping things I used, but for the base, I used base coat, fast-dry top coat and matte top coat by Glisten & Glow, White Out, Street Style Princess and Don't Get Elfed Up by China Glaze. I know my stamping isn't perfect yet, but I'll keep practicing until it somewhat is. Luckily this is art so there's kind of no right or wrong. 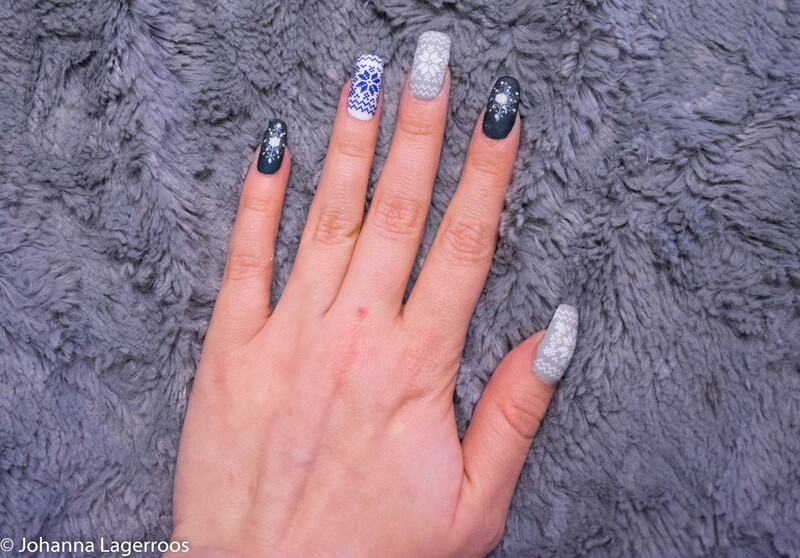 What do you think about this winter mani? Let me know in the comments! That's it for today's post, but I'll be back with another one very soon! I'm trying my best to have more or less daily posts up this month, but won't be stressing out if I miss a day. Since my blogging is Still just a little hobby for me, I can't be stressing out about it as it's supposed to be fun. As well as the Holiday times. I refuse to stress about anything related to Christmas, this time is too fun for that. But, to let you in on some of the things, I have planned posts on Christmas treats, Holiday stress, DIY gifts and calendar openings - to name a few. I hope that sounds at all interesting to you, and I will see you all in my next post!